Velocity was founded by Tom Black just outside of Brisbane, Australia in 1989. Their first product was an adjustable aluminum waterbottle cage called the 'Velocage'. It was such a clever and simple design that sales spread outside of Australia to the United States, by way of Tom's brother John Black of Kentwood, Michigan. As the company grew, so did its product offering and in 1991 they introduced their first aluminum rim, the Aero. Velocity set itself apart by offering a variety of rim drillings, sizes, and colors for the custom wheel builder. Velocity's reputation was formed by providing an exellently manufactured and high quality product, with service and flexibility that is unmatched. Blunt SL in black. Image courtesy of Velocity USA. 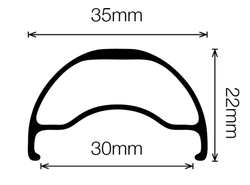 RIM SIZE: available in 26", 27.5" and 29"
Blunt in black. Image courtesy of Velocity USA. 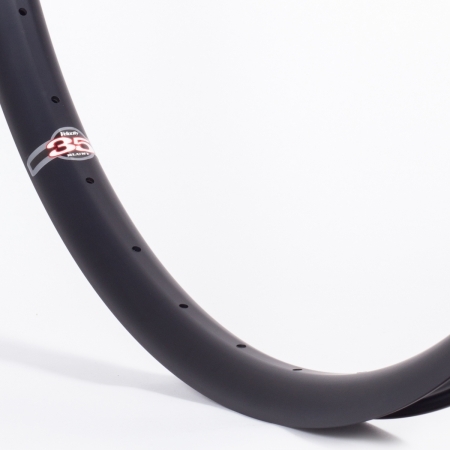 Look no further, 'cause you have just found the best 29er rim on the market. You want them wider, stonger, and lighter? Done! Designed with a wider footprint in mind the Blunt will burn through the trails and rip through the slop. For the road, dirt, slush, grass, rocks, or trees, hold on tight this rim is gonna blow your mind. Blunt 35 in black. Image courtesy of Velocity USA. 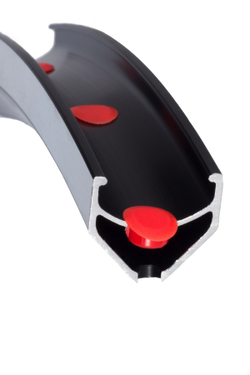 Red Veloplug. Image courtesy of Velocity USA.